I did pretty well with the menu last week, using most of the same ingredients when I didn’t cook the correct meal. It is a work in progress, and having a child come home sick in the middle of the day always changes things. This week we should be back to normal routine and hopefully the meal planning will work out. I am working hard to be flexible though and meals can easily be moved to another day if the need arises. Monday: Lunch: Chicken noodle soup, croissant, fruit. Supper: Ham, mashed potatoes and vegetables. Tuesday: Lunch: Leftover ham, croissant, fruit. Supper: Home made oven baked chicken fingers, oven fries and raw veggies. Wednesday: Lunch: Sushi. Supper: Breakfast for dinner. Thursday: Lunch: Pizza Supper: Twisty Pasta and tomato sauce. Saturday: Lunch: Leftover pizza. Supper: Roasted chicken or roast, with oven roasted vegetables. 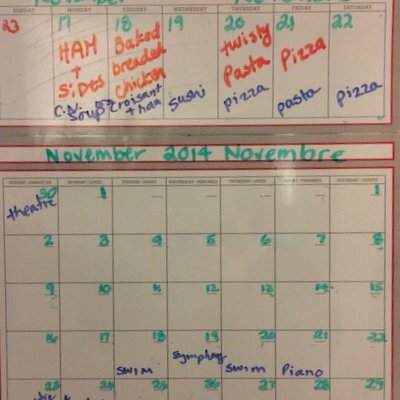 I have also started putting the meal plan back up on my fridge so I can remember what I am planning. Back to the basics every time. What is on your plan this week? Sorry, I am just getting in a quick post. Between choir practice, voting and tabletop games with the family, and then with friends I didn’t have time to write. Tomorrow is a day of BC civic elections and if we are lucky we will get out more than 30% of the population to vote. Even though we have a fucked up system and you need to bring a list of just under 30 names for Mayor, School Trustee, Park Board and City Counselor, go vote if you are eligible. Even though it would be much easier to have a ward system so you only need to figure out 4 names, go vote. Even though it might be more fun to go shopping or get a coffee, take the time to go vote. If you need a list of name so you can figure out at least who belongs to what party go here.